sdif is inspired by System V sdiff(1) command. The basic feature of sdif is making a side-by-side listing of two different files. All contents of two files are listed on left and right sides. Center column is used to indicate how different those lines. No mark means no difference. Added, deleted and modified lines are marked with `<' and `>' character. 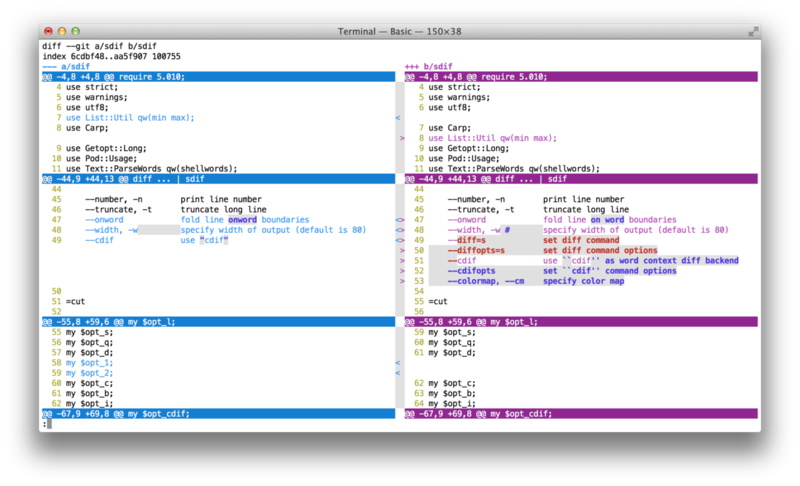 It also reads and formats the output from diff command from standard input. 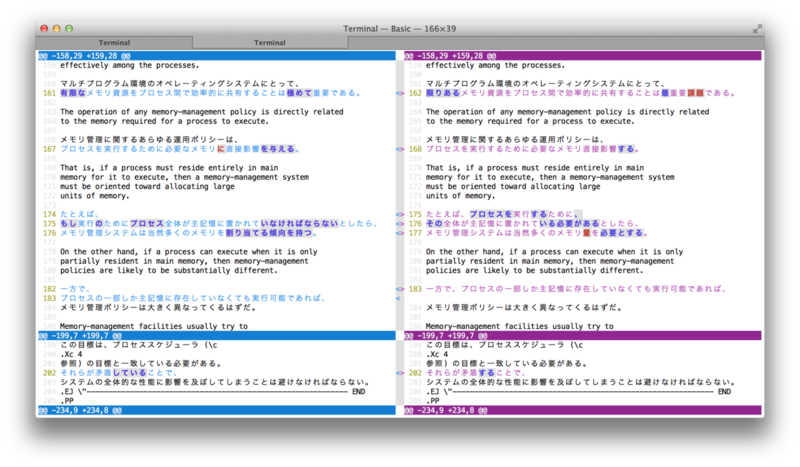 Besides normal diff output, context diff -c and unified diff -u output will be handled properly. 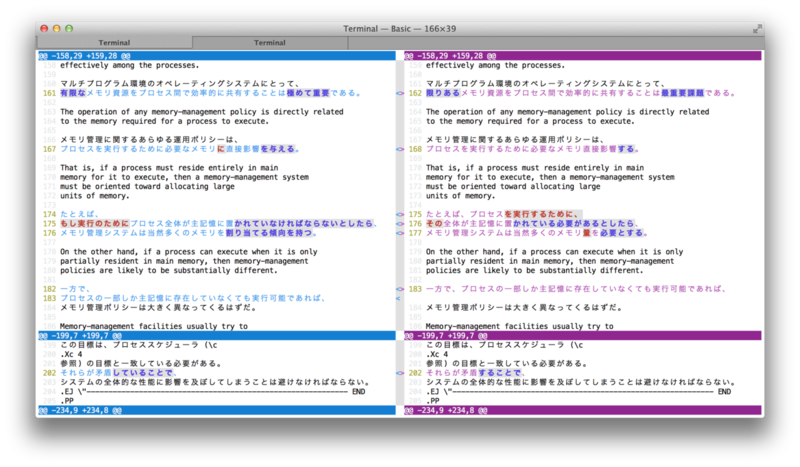 Each lines can be displayed in different colors. Read --colormap section in ths manual for detail. While sdif doesn't care about the contents of each modified lines, it can read the output from cdif command which show the word context differences of each lines. Option --cdif set the appropriate options for cdif. Set --nocc, --nomc options at least when invoking cdif manually. Option --notc is pereferable because text color can be handled by sdif. Environment valuable SDIFOPTS is used to set default options. Use width as a width of output listing. Default width is 80. If the standard error is assinged to a terminal, the width is taken from it if possible. Print line number on each lines. Line number is diplayed in 4 digits by dafult. Use this option to change it. Passed through to the back-end diff command. Sdif can interpret the output from normal, context (diff -c) and unified diff (diff -u). Truncate lines if they are longer than printing width. Fold longs line at word boundaries. Use cdif command instead of normal diff command. Specify options for backend cdif command. Pass --mecab option to backend cdif command. Use --cdifopts to set other options. Any command can be specified as a diff command to be used. Piping output to sdif is easier unless you want to get whole text. Specify options for backend diff command. Specify the position for mark. Choose from left, right, center, side or no. Default is center. Use ANSI color escape sequence for output. Default is true. E is effective for command, file and text line. That line will be expanded to window width filling up by space characters. Left column is expanded always. You may want to use this to set background color for right column. Try next setting if you want to make modified section more visible.